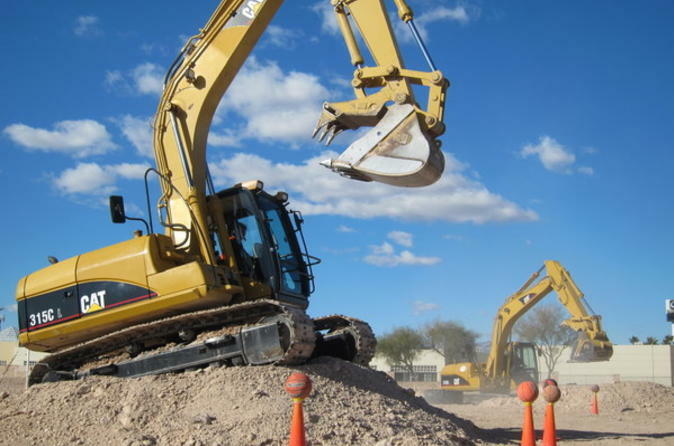 Meet at a giant sandbox in Las Vegas and receive a brief safety instruction and equipment orientation. You'll be given a hard hat, vest and 2-way radio before climbing aboard a real-life excavator or bulldozer for a unique and fun experience! Via your radio headset, expert constructors will walk you through the levers and buttons, letting you maneuver these heavy-duty machines like a pro. Dig trenches, build mounds and move and stack 2,000-pound (909-kg) tires! Play several fun, safe games like ‘Excavator Basketball,’ where you try to pick up a basketball off a cone and place it into your tire basket, or build your own ‘Bulldozer Teeter-Totter,’ where you’ll dig and move dirt into a mound and rock back and forth on top of it! Choose between two packages: with the Big Dig Experience, maneuver either an excavator or a bulldozer. If you want the ultimate construction experience, choose the Mega Dig Experience and control both machines! Mini Excavator Experience (60-minute experience) In the luxury of a climate controlled cab, enjoy the thrill of operating this fun sized, 5.5 ton digger. Dig deep, play excavator basketball and back fill with a blade and bucket. You’ll leave with a certificate of completion and, without a doubt, a smile on your face.